Issac Marshall | A hotdog with sauerkraut is one of the few meals you can get from Uncle Larry’s Snack Shack. I don’t know a lot about food, but don’t go to Uncle Larry’s Snack Shack in the Emporium looking for high end, fine dining. That’s not what Uncle Larry is all about. 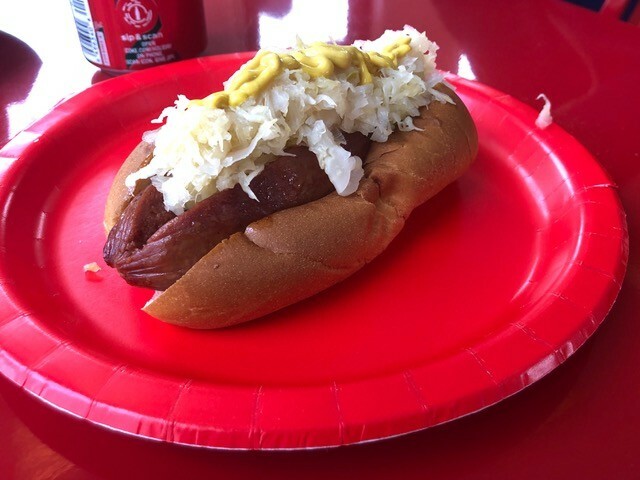 Instead, if you want to get a damn good hotdog with sauerkraut that reminds you of the first time you caught a baseball game, then by all means, the Snack Shack is the place to be. I’m not a fancy man, I like the simple pleasures in life, and nothing is more simply pleasurable than the comfort food sold at the ‘Snack Shack.’ And as a result, it hit me right where I needed it to hit. In other words, it’s just a good place to eat. The food was as quick as it was delicious. I was able to go in, order my food and get out of there in the 10 minutes between two of my classes. Just make sure you go at the right time, I went that night before at 6 p.m., before the website said it closed (at 7 p.m.) and there wasn’t a soul in the place. The lights were off and doors were locked. It was closed. I am inclined, however, to give the Snack Shack a pass on that count, the hot dog was really good you guys. My only regret was I couldn’t stay and talk to the titular Uncle Larry (yes, he’s a real man). He seemed like the kind of guy who will talk your ear off about his life, but never seems to bore you. He is just that kind of guy. I’m looking forward to eating there again.